Valencia is the third biggest city in Spain, and a beautiful one. It is known for many things, including a good football team, great weather all year round, the famous Valencian paella, the cathedral which contains the holy grail, a beautiful dry river crossing the whole city, filled with parks, attractions, green gardens, cafes and in summer, an open air cinema. Finally, Valencia is the greenest city in Spain, so there are some truly amazing parks and gardens to see. So what better place to go on a 3 hour guided bike tour? There is a massive advantage to the Valencia Bike Tour activity, the city it is very flat, so you can easily ride while you take in the views and landscape around you. It is a very enjoyable and easy way of discovering the sunny city of Valencia. The tour begins at the heart of the Old city of Valencia. After you get a chance to try your bikes out and adjust the seats, you will head off with the guide through the city centre on the many bike lanes here. 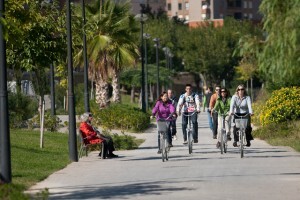 Cycle through the wonderful parks like the Cabecera, the Historic centre, the Turia and make your way down the dry river, through the most attractive gardens around. Take a short break at the arts and sciences museum for a group photo and a recap of everything. This is also a beautiful part of Valencia, so you might want to just take in the massive white and futuristic looking monuments as this is the most recognisable monument in Valencia (and also the recent filming location of Disney´s latest film), and then we cycle down to the port and beach. Have a refreshing drink and take in the views with the cool breeze coming from the Mediterranean Sea. After all that, we get back on our bikes and make our way back to the city centre. This activity is easy, fun and full of fascinating information about the city.